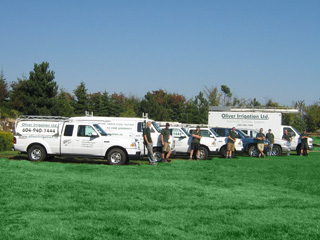 Oliver Irrigation Ltd. was established in (1988) and is a recognized irrigation company specializing in Commercial and Residential Irrigation Systems. Oliver Irrigation Ltd. offers a comprehensive warranty (2 yrs) and Total Customer Service and Quality Workmanship as well as efficient and courteous service. Not only will a sprinkler system keep your landscaping lush all year round while freeing you to do other things, it will save you money too. An automatic sprinkler system is one of the best investments you can make in your home. Just ask anybody who has one. In addition to providing trouble free, cost effective watering, it will enhance the value and saleability of your home. Also, having a fully computerized irrigation system programmed in accordance to the municipal water restrictions will eliminate confusion regarding which days you may water on and for how long.